Every week we make a pitcher of delicious fruit infused water. There are so many delicious combinations to make! Today's batch is filled with fresh orange and apple slices. It's delicious right away but the longer it sits the more flavorful it becomes. We like to make a batch first thing in the morning and by mid-morning it's a fruity refreshing treat! 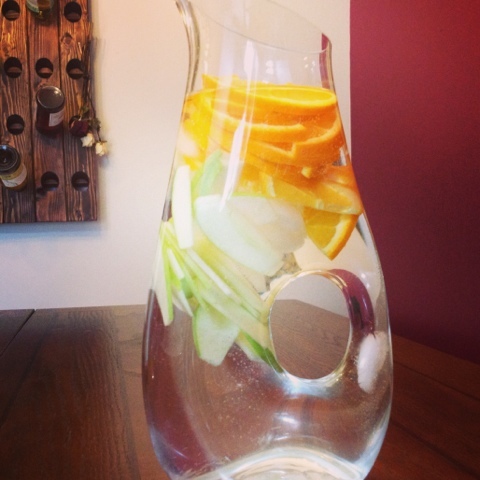 Simply slice up your fruit, add it to a pretty pitcher & top with ice & water. How funny i just started writing a post about citrus water, GREAT minds! I love drinking flavored water! I actually have a diffuser from Crate & Barrel that is made especially for flavored water, and it is awesome. Oh fun, we might have to check out Crate & Barrel :) thanks for stopping by! Enjoy your week! need to try this out! been seeing a lot of recipes for flavored water - it looks sooo refreshing and perfect for the upcoming summer :) thanks for sharing it! Thanks Amanda! Hope you enjoy! I love this! :) I just started adding frozen fruit to my water as ice, but this will be even better (I just took the lazy-girl way earlier hehe). This kind of reading material isn’t something I’m usually interested in. However, I thoroughly enjoyed reading your content. It’s obvious you put a lot of work into this. Good work. Apple's iPhone SE positions at Number 10 chiefly on the grounds that there are such a variety of other first rate telephones, additionally in light of the fact that it has a drained plan, screen that is quite a long while old and a show size that is too little to get sucked into applications and motion pictures on the move.Really this post is useful for us.